The challenge lies, as for any restaurant, in attracting guests and then meeting their expectations. But with a restaurant which promulgates not just delicious food, but also Korean food, the challenge becomes a different one. 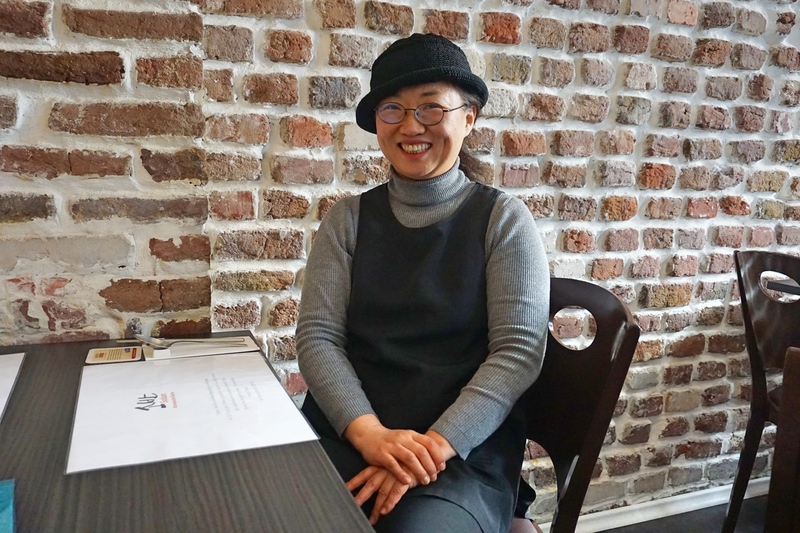 In a conversation I had this month with manager Rang Lee, sister to chef Hun Lee, she tells me that roughly fifty percent of customers who come to their restaurant have never tried Korean food before, whereas the other half are crazy about Korea and all the culture around it (K-pop, K-drama, etc.). Attracting this fifty percent and more who have never tried Korean food is far from an easy feat. Not only are potential guests faced with a new, by-them-untested restaurant, but also with a whole new eating culture. While there are many things we enjoy eating as omnivores, we don’t like risking failure in food enjoyment either. If we haven’t tried something before and we don’t know anyone who has, chances are we’re likely to opt for something more familiar. Therein lies challenge number one for a Korean (or any nationally-defined) cuisine which, at least at first glance, seems to have more differences than similarities to (in this instance) a German one. Challenge number two consists of preconceptions. Guests who have already tried Korean food may be more familiar with it, but it can also give them a false sense of authority on the subject. One guest, Mrs. Lee confides in me, had a very fixed opinion about how a certain dish should be made – based on his having eaten this dish at Korean families’ homes in Germany. He was convinced that the way it was served at Soban, already grilled, was anything but authentic. But who is to say what is considered authentic? And is there only one authentic way? What does “authentic” even mean? Some ingredients such as dandelions become a lost tradition, no longer part of the culinary repertoire. Too many other foods exist to choose from, it takes too much time and effort to prepare. While so-called “old-fashioned” cuisine can get left behind, chefs are eager to invent something new, something we call fusion food. This fusion food is still fresh and new. It is marketed and understood as a mixture of two culinary worlds or more – not seen for what it is, but for what it puts together. This, until it starts blending in with local eating culture, and becomes authentic food – Korean or otherwise. Korean food in Germany is changed by German guests, much like their palates are changed by Korean food. It’s what some might call compromise, others a symbiotic relationship. The degree to which this works varies from person to person, restaurant to restaurant. But it’s quite clear that it’s never a one-way street. When Mrs. Lee and brother Mr. Lee put together the menu, she was very skeptical about whether his seaweed salad would work. In her twenty-year experience in Germany, she knew that German people did not eat seaweed very willingly. Surprisingly, however, German guests greatly enjoy Mr. Lee’s version – now very high in popularity. And there are also guests, so Mrs. Lee tells me, who happen to change (for the better) their opinion about a previously disliked food. On her annual visits she even brings back Korean memorabilia, which can be viewed in a vitrine, and collected with stamps that are given on a card upon return visits. But she also knows she can only do such much as give out information. There are guests who treat the rice, vegetables and gochujang (red chilli paste) of bibimbap as separate units. But in Korea all the ingredients are mixed together to harmonize together in one’s mouth. After all, there is a reason why the dish is called “mixed” (bibim) “rice” (bap). But as good hosts, and individuals not stuck with “authentic” ways, Mrs. Lee and her brother respect and appreciate other ways of eating. I ask her if she eats Korean food at home, her home in Germany. She laughs and says that since her brother cooks Korean food so well, she prefers to cook German (she lists bread, frikasse, goulash, etc.) or Italian food. After all, food is a major gateway to a culture, and what more exciting in a job than to be one of its ambassadors. Challenging, yes, but all the more rewarding. This is part of a series on the challenges and innovations for Korean restaurants abroad. If you’d like to read more, see the Gogi Matcha article (Düsseldorf), or the Arirang article (Stockholm).